Our editors review and recommend products to help you buy the stuff you need. If you make a purchase by clicking one of our links, we may earn a small share of the revenue. However, our picks and opinions are independent from Techlone’s newsroom and any business incentives. If you’re anything like me you’ve spent the bulk of your gaming career fatefully devoted to the console life. But maybe, like me, you’re starting to think about investing in a proper PC gaming setup to get in on all of those games you’ve missed out on over the years. But where do you start? Obviously, you’ll need a computer—desktop or laptop?—but have you thought about every other scrap of hardware you’ll need? What about a keyboard, mouse, and headset? 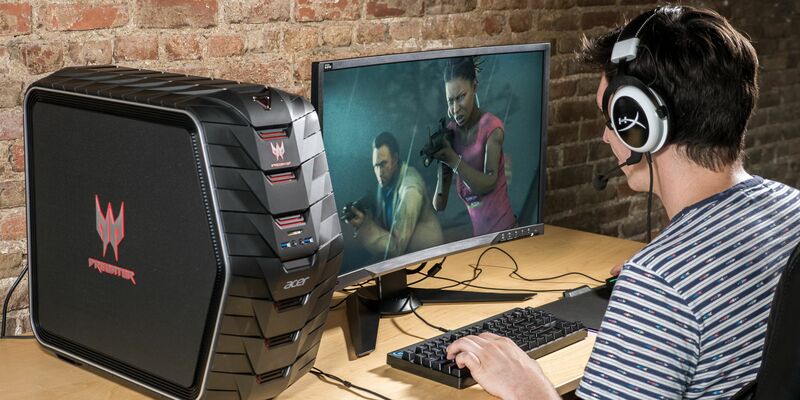 There’s a lot that goes into a PC gaming setup and lucky for you, we’re here to guide the way. We’ve tested and reviewed dozens if not hundreds of gaming mice, gaming keyboards, gaming headphones, VR-ready desktops, and gaming laptops in order to find the best in each category. Now that we can definitively say what’s the best keyboard or mouse for gaming, here is what you need to set yourself up as a PC gaming pro. It hits that sweet spot of affordability and power that’s perfect for anyone who’s just starting out in the PC gaming world. Plus, it’s not the hulking behemoth that other desktops turn out to be. In fact, it’s sized perfectly to fit in a smaller space like an apartment or modest living room. Another key selling point was the port layout. You’ll most likely be removing and hooking up your VR headset of choice multiple times a day or week. You want that process to be as painless as possible and the G11CD makes it cinch thanks to clearly marked ports that won’t leave you frustrated with a handful of cables. So if you’re looking to game on the go, we’d recommend spending the extra dough to get a machine that will live up to your expectations. A gaming laptop won’t be able to reach the levels of performance a desktop can muster (usually for less money) but if portability is important you might not have a choice. While the HyperX Cloud is an older model that’s been succeeded by the HyperX Cloud II, the original Cloud headset is still the best headset for most people. It’s extremely comfortable and comes packaged with leatherette or velour earcups, an audio control box, and a detachable mic. The aluminum body is strong, and durable enough to last a good long while if you plan on taking your gaming on the go. When it comes down to the audio performance, you’ll need to be a little cautious. These things are explosively loud—if you’re not careful they could destroy your ears. But once you’ve dialed in the correct volume, you’re left with a headset that delivers every note and range of your game audio with beautifully detailed clarity. I was constantly surprised by new sound effects I heard while playing Overwatch, a game I’ve logged well over 400 hours on. That’s not to mention the detachable mic that—while not as clear and powerful as the Razer ManO’Wars—still left me impressed. When we tested gaming mice there was a lot to consider when it came to finding the best. Thanks to its focus on ditching extraneous features in order to focus on what’s really important, the Mamba Tournament Edition is far and away the best gaming mouse for most gamers. Unlike a lot of the mice we tested, the Mama Tournament Edition felt great to use thanks to higher-quality materials and a balanced weight that didn’t need to be balanced in the slightest. Unless you need a button-heavy mouse to map your hotkeys for an MMO or MOBA, this is the best gaming mouse for your money.